Carroll Hall Shelby (January 11, 1923 – May 10, 2012) was an American automotive designer, racing driver, and entrepreneur. He was best known for his involvement with the AC Cobra and later the Mustang-based performance cars for Ford Motor Company known as Shelby Mustangs, which he had modified during the late-1960 and early-2000. He established Shelby American Inc. in 1962 to manufacture and market performance vehicles and related products, as well as Carroll Shelby Licensing in 1988, that currently make up Carroll Shelby International. Shelby was born on January 11, 1923, in Leesburg, Texas, to Warren Hall Shelby, a rural mail carrier, and his wife, Eloise (Lawrence) Shelby. Shelby suffered heart valve leakage problems by age 7 and spent most of his childhood in bed. By age 14, Shelby's health improved and he was subsequently declared to have "outgrown" his health problems. Shelby's first wife was Jeanne Fields; they married on December 18, 1943. Their daughter Sharon Anne Shelby was born a year later on September 27, 1944. They had two more children — sons named Michael Hall (born November 2, 1946) and Patrick Bert (born October 23, 1947). Shelby and Fields later separated and divorced in February 1960. In 1962, Shelby married actress Jan Harrison but the marriage was annulled the same year. Shelby dealt with health issues throughout his life. He took nitroglycerine pills when he was racing because of his heart. He had a heart transplant in 1990 and a kidney transplant in 1996. Shelby died on May 10, 2012, at the age of 89. He had been suffering from a serious heart ailment for decades. Shelby honed his driving skills with his Willys automobile while attending Woodrow Wilson High School in Dallas, Texas. He graduated from Wilson in 1940. He was enrolled at The Georgia School of Technology in the Aeronautical Engineering program. However, because of the war Shelby did not go to school and enlisted in the United States Army Air Corps, serving in World War II as a flight instructor and test pilot. He graduated with the rank of staff sergeant pilot. Subsequently, he had short stints as an oil-well roughneck and as a poultry farmer prior to his racing career. Starting out as an amateur, he initially raced a friend's MG TC. He soon became a driver for the Cad-Allard, Aston Martin, and Maserati teams during the 1950s. Driving for Donald Healey, in a modified, streamlined, and supercharged Austin-Healey 100S, he set 16 U.S. and international speed records. Teamed with Roy Salvadori, and driving for Aston Martin, he won the 1959 24 Hours of Le Mans. He drove in the Mount Washington Hillclimb Auto Race in a specially prepared Ferrari 375 GP roadster, to a record run of 10:21.8 seconds on his way to victory in 1956. The highlight of his race driving career came in 1959, when he co-drove an Aston-Martin DBR1 (with Englishman Roy Salvadori) to victory in the 24 Hours of Le Mans. During this race he noted the performance of an English GT car built by AC Cars, known as the Ace. Three years later, the AC Ace would become the basis for the AC Cobra. After retiring from driving in October 1959 for health reasons, he opened a high-performance driving school and the Shelby-American company. He obtained a license to import the AC Cobra (often known in the US as the Shelby Cobra), a successful British Sports racing car manufactured by AC Motors of England, which AC had designed at Shelby's request by fitting a Ford V8 to their popular AC Ace sports car in place of its standard AC six, Ford Zephyr or 2 liter Bristol engine. Shelby remained influential with Ford manufactured cars, including the Daytona Coupe, GT40, the Mustang-based Shelby GT350 and Shelby GT500. After parting with Ford, Shelby moved on to help develop performance cars with divisions of the two other Big 3 American companies, Dodge, and Oldsmobile. 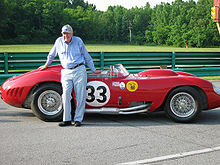 Ford provided financial support for AC's Cobras from 1962 through 1965 and provided financial support for the Ford GTs, first with John Wyer's Ford Advanced Vehicles in 1963 and then with Shelby American from 1964 through 1967. In the intervening years, Shelby had a series of ventures start and stop relating to production of "completion" Cobras — cars that were allegedly built using "left over" parts and frames. In the 1960s, the FIA required entrants (Shelby, Ford, Ferrari, etc.) to produce at least 100 cars for homologated classes of racing. Shelby simply ordered an insufficient number of cars and skipped a large block of Vehicle Identification Numbers, to create the illusion the company had imported large numbers of cars. Decades later in the 1990s, Carroll alleged that he had found the "left over" frames, and began selling cars which were supposedly finally "completed". After it was discovered the cars were built from scratch in collaboration with McCluskey, Ltd., they were re-termed "continuation" Cobras. The cars are still built to this day, known as the current CSX4000 series of Cobras. He was inducted into the International Motorsports Hall of Fame in 1991, the Motorsports Hall of Fame of America in 1992, and the Automotive Hall of Fame in 1992 . He was inducted into the SCCA Hall of Fame on March 2, 2013. In 2003, Ford Motor Co. and Carroll Shelby mended ties and he became technical advisor to the Ford GT project. In that same year, he formed Carroll Shelby International, Inc., based in Nevada. Shelby's Series 1 roadster used Oldsmobile's 4.0 L L47 Aurora V8, but was poorly supported by the ailing GM division. Prior to production of the Series 1, significant costs were incurred in testing and certification required to conform to 1999 Federal Motor Vehicle Safety Standards. Once completed, a total of 249 production Series 1 cars were constructed by Shelby American, Inc. as year 1999 models. During production, Venture Corporation purchased Shelby American, Inc. The purchase included the Series 1 model, but not the rights to produce the "Continuation Series" Shelby Cobras. In 2004, after a subsequent bankruptcy by Venture Corporation (unrelated to the acquisition of Shelby American), Carroll Shelby's new company, Shelby Automobiles, Inc., purchased the Series 1 assets for pennies on the dollar. Included in the asset purchase were enough components to produce several more complete Series 1s. Because the 1999 Federal Motor Vehicle Safety Standards certificate had expired, and the cost to re-certify the car was prohibitive, all Series 1's produced after that date were completed as "component cars" and delivered with no engine or transmission. Those "component car" models built in 2005 are identified with a seven-digit vehicle identification number (VIN) and were designated with a CSX5000 series serial number. The original 249 were production cars with a seventeen-digit VIN. The Series 1 was produced in both supercharged and normally aspirated versions. Supercharged cars were also outfitted by the factory with larger brakes and a heavy duty clutch. Performance is near "supercar" category with a 0 to 60 mph time at 4.1 seconds for the supercharged version. Nicely optioned, Series 1 had power steering, power disc brakes, factory air conditioning, power windows, and an AM/FM/CD audio system. The convertible top folded away out of sight in a compartment located behind the cockpit. Some component cars were sold as roadsters, with no convertible top. The new contract between Ford Motor Company and Carroll Shelby signaled hope for Shelby products built under Ford. In 2004, a new Ford Shelby Cobra Concept was shown off at U.S. car shows. Built with a retro body mimicking the 1960s Cobras mixed with modern touches, it was based on the Ford GT chassis (reworked for front engine/rear wheel drive) powered with a 6.4 L V10 engine that produced 605 hp (451 kW). It received overwhelmingly positive press reviews and has won the "Best In Show" award at Detroit International Auto Show. A coupe version of the Shelby Cobra roadster was introduced the following year. The Ford Shelby GR-1 concept car of 2005. While sporting a completely modern design, it showed a nod to the 1960s Shelby Daytona. The GR-1, like the Cobra, is based on the GT's chassis. Press reviews for the GR-1 have been positive. The car was featured on the cover of Motor Trend and Car Magazine. The Ford Shelby GR-1 could possibly be built, taking over the Ford GT's production line after its production comes to an end. In 2005, the Shelby GT500 was revealed at the New York International Auto Show, and became available in the summer of 2006 as part of the model year 2007 lineup. It is powered by a 5.4 Liter Modular V8, with four-valves-per-cylinder heads borrowed from the $150K Ford GT supercar, an Eaton M122 Roots-type supercharger and is rated by Ford at 500 hp (370 kW) and 480 ft·lbf (650 N·m) of torque. It boasts a Tremec T-6060 manual transmission, reworked suspension geometry, 18-inch wheels, functional aerodynamic body kit, and still retains the solid rear axle. The GT500 starts at an MSRP of $40,930 for the coupe, and $45,755 for the convertible version. Although Carroll Shelby had no hands-on involvement in the design of the car, he did provide Ford and SVT (Special Vehicle Team) input on what would make the car better and convinced Ford to enlist wider rear tires (from 255 mm wide to 285 mm wide). Shelby, in cooperation with the Hertz Corporation, produced 500 cars named "Shelby GT-H" in 2006. This was a special-edition Ford Mustang GT, available for rental from Hertz. A Ford Racing Performance Group FR1 Power Pack increased the GT's 4.6 L V8 engine to 325 hp (242 kW). The cars included a custom Shelby hood and black and gold body styling, incorporating a gold-plated "Hertz" nameplate on both sides. A consumer version of the Shelby GT-H was available from Shelby through Ford dealers, called the Shelby GT. There were 5,682 vehicles for 2007 and 2,300 for 2008 were built. They had the same engine as the GT-H, but more suspension, appearance and drivetrain upgrades and was available with either manual or automatic transmission. White and black colors were available for 2007 models and grabber orange or vista blue were available for 2008. A convertible was available in 2008 also. An available upgrade from the Shelby factory in Las Vegas were a few different superchargers. It then was called a Shelby GT/SC. All Shelby GTs are shipped with the Shelby serial number (CSM) on the dashboard badge and in the engine compartment, such as 07SGT0001 or 08SGT0001. In his later years, Shelby brought several lawsuits against companies making copies of the Cobra body for use on kit cars – ostensibly for copyright, trademark and patent violations. Despite the litigation, the Cobra kit car industry continues to thrive. One of the lawsuits involved the Superformance Brock Coupe, a copy of the original Shelby Daytona Coupe. The Superformance Brock Coupe was designed by Pete Brock, who had also designed the original Daytona Coupe for Shelby. Shelby American sued Superformance after Superformance had developed and begun production of the Superformance Brock Coupe. Eventually, the litigation was settled, though the terms of the settlement (if any) have never been released to the public. As a result of the agreement between the two companies, the product is now known as the Shelby Daytona Coupe, despite being neither designed nor built by Shelby American. Nearly 150 of these new Shelby Daytona Coupes have been built as of February 2007. In 2002, Unique Performance, a company of Farmers Branch, Texas, purchased a license from Carroll Shelby Enterprises to place his name on a series of continuation vintage vehicles. This company specialized in recreating 1960s-style Shelby Mustangs. They purchased used Mustangs and installed updated versions of the Shelby 325-horsepower 302-cubic-inch V8 engine. They also utilize modern five-speed manual transmissions, brakes, steering, suspension, interiors and entertainment systems. Because Shelby's license was purchased, these cars have Shelby serial numbers. In October 2007, Carroll Shelby ended his licensing agreement with Unique Performance due to numerous issues of customer complaints where vehicles were not delivered. Unique Performance was subsequently raided by law enforcement due to VIN irregularities and declared bankruptcy, which effectively ended the Shelby continuation "Eleanor" Mustang production. Shelby was in turn sued by victims of Unique Performance for his involvement in the criminal activity. The 2000 remake of Gone in 60 Seconds movie highlighted the star car character "Eleanor," a customized 1967 Mustang. Some custom car businesses began to reproduce "Eleanor" looking cars with the trademarked name, causing Denice Halicki to again take legal action to protect the trademark and the copyrighted Eleanor's image. In 2008, Halicki won a case against Carroll Shelby, who was also selling "Eleanor" using the trademark name and copyrighted image. Carroll Shelby's name is associated with a chili fixings kit. The kit consists of spices in several packets in a miniature brown paper bag. On the side of the bag is a story related by Shelby about cooking chili during his racing days. On the front of the bag is a depiction of a big western black hat, a trademark piece of clothing for Shelby. He was a founder of the Terlingua International Chili Championship in Terlingua, Texas. In 1967, Shelby marketed a men's grooming product, the "Carroll Shelby's Pit-Stop ... a Real Man's Deodorant" that was promoted in car magazines. Shelby was the initial partner of Dan Gurney in establishing Gurney's All American Racers. Donzi Marine developed the Donzi Shelby 22 GT, a 22-foot (7 m) speedboat based on their Classic line of boats in collaboration with Carroll Shelby. Carroll Shelby produced a line of eight-spoke alloy wheels for Saab automobiles in the early to mid-1980s. They were available in gold (Goldvane), hammered silver (Silvervane) finish, and a black hammered finish. These wheels were available through Saab dealers and could be fitted to Saab 99 and Saab 900 models manufactured through 1987. Shelby supported a project with Rucker Performance Motorcycles to manufacture 12 Shelby motorcycles that were designed by William Rucker. In 2008 Shelby was awarded the 2008 Automotive Executive of the Year Award. Shelby established the Carroll Shelby Children's Foundation to cover medical bills of children who have heart disease, but are unable to pay for treatment. "About Us". shelby.com. Retrieved March 20, 2016. "The Official Carroll Shelby Website: History page". Carrollshelby.com. Archived from the original on 20 November 2010. Retrieved 12 February 2013. Ricci, Dean V. (July 15, 2007). "Carroll Shelby – Living Legend". Shelby American Automobile Club: Motor City Region. Retrieved January 2, 2011. Glick, Shav; Hirsch, Jerry (12 May 2012). "Carroll Shelby dies at 89; cult classic car designer". Los Angeles Times. Retrieved 12 February 2013. Box, Terry (May 11, 2012). "Legendary racer, car-builder Carroll Shelby dies in Dallas at 89". The Dallas Morning News. Retrieved May 11, 2012. "Legendary car designer Carroll Shelby dies". Associated Press. 11 May 2012. Retrieved 12 February 2013. Eisenstein, Paul A. (14 May 2012). "Carroll Shelby Dead at 89". The Detroit Bureau. Retrieved 15 May 2012. "Woodrow Wilson High School, Dallas, Texas: Class of 1967 Home Page". www1967.com. Retrieved January 2, 2011. Carroll Shelby, Statements made at the Formula SAE awards ceremony in May of 1993. Lyons, Pete (15 May 2012). "Carroll Shelby: 1923-2012". Autoweek. Retrieved 12 February 2013. Egan, Peter (August 2012). "Carroll Shelby: An American Original". Road & Track 63 (12): 80–83. "Records". climb to the clouds. Retrieved 12 February 2013. Blair, Sam (December 29, 2007). "At 84, legendary Shelby keeps pedal to the metal". Los Angeles Times. pp. C1, C6. Retrieved January 2, 2011. Lewandowski, Dave (January 8, 2013). "Notes: Rahal among five elected to SCCA Hall". IndyCar. Retrieved January 9, 2013. Davison, Eric (2004). Snake Bit: Inside Carroll Shelby's Controversial Series 1 Sports Car. MBI Publishing. p. 10. ISBN 978-0-7603-1781-5. Retrieved January 3, 2011. When Lee Iacocca became president of Chrysler, he called Shelby back to infuse some life into the bland little automobiles that were the backbone of Dodge. Between 1986 and 1989, Shelby responded with a series of Dodge cars that were blindingly fast and performed far beyond anyone's expectations. Young, Tony (2004). Chrysler, Dodge, Plymouth Muscle. BMI Publishing. p. 172. ISBN 978-0-7603-3204-7. Retrieved May 15, 2011. "Shelby Dodges and Dodge Shelbys". Shelby-dodge.com. Retrieved 27 December 2015. "Shelby Series 1" (PDF). Car and Driver. Retrieved 27 December 2015. Johnson, Merritt (November 6, 2007). "Unique Performance raided by local police – Autoblog". Autoblog.com. Retrieved January 2, 2011. "Unique Performance victims sue Carroll Shelby". StreetConcepts.com. April 3, 2008. Retrieved January 2, 2011.
Business Wire (2008-11-13). "Ninth Circuit Court Hands Winning Victory to Denice Halicki in Dispute with Carroll..." (Press release). Reuters. Retrieved 27 December 2015. "Recent Win: Ninth Circuit reverses judgment against GMSR's clients in copyright/trademark case concerning "Eleanor" from "Gone In 60 Seconds"". Greines, Martin, Stein & Richland. 12 November 2008. Retrieved 27 December 2015. Smith, Jonny (April 9, 2009). "1967 Ford Mustang ‘Eleanor’ recreation". The Times (London). Retrieved April 9, 2009. Bowers, Jesse (January 19, 2010). "1967 Carroll Shelby Advertising of Pit Stop deodorant, sad, Really sad.". Just a Car Guy. Retrieved March 20, 2016. Bornhop, Andrew (May 2012). "Celebrating 50 Years of Shelby". Road & Track 63 (9): 52–61. Laban, Brian (2015). Shelby and AC Cobra. Crowood Press. ISBN 9781785000041. Retrieved March 20, 2016. Neil, Dan (July 2000). "Shelby Series 1 Titan Motorcycle". Car and Driver. Retrieved March 20, 2016. Dean, Paul (May 15, 1993). "Questions have been raised over Carroll Shelby's claim he's building 43 of his classic Cobras using original chassis. Shelby says he's the victim of a business feud". The Los Angeles Times. Retrieved January 2, 2011. Carroll, William (1964). Ford Cobra Guide. Sports Car Press. ISBN 0-87112-066-6. An inside look at early Cobra racing 1962 through 1963. Shelby, Carroll (1965). The Cobra Story. Motorbooks. ISBN 978-0-87938-019-9. Shelby's story of his life and racing through 1964. Shelby, Carroll (1967). The Carroll Shelby Story. Pocket Books. A revised and enlarged version of "The Cobra Story," covering the Cobra's successes in 1965 and 1966, as well as including technical specifications for the 289 and 427 Cobras. Shoen, Michael L. (1990). The Cobra-Ferrari Wars 1963–1965. Cfw Guidebooks. ISBN 978-0-9625093-0-8. Covers Cobra and Ferrari racing through 1965. Levine, Leo (2001). Ford, the Dust and the Glory: A Racing History, 1901–1967. Society of Automotive Engineers. ISBN 978-0-7680-0663-6. Ford racing programs through 1967. Shelby began working with Dodge at the request of Chrysler Corporation chairman, Lee Iacocca. Iacocca had previously been responsible for bringing Shelby to the Ford Mustang. After almost a decade of tuning work, Shelby was brought on board as the "Performance Consultant" on the Dodge Viper Technical Policy Committee made up of Chrysler's executive Bob Lutz, Product Design chief Tom Gale, and Engineering Vice President François Castaing. Shelby was used for his wealth of experience to make the Viper as light and powerful as possible.